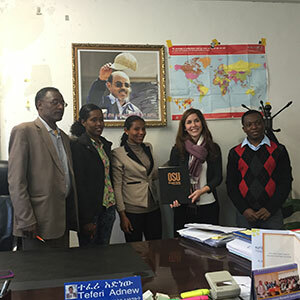 College of Public Health and Human Sciences Assistant Professor Stephanie Grutzmacher and CPHHS MPH student Araya Assfaw recently traveled to Debra Berhan, Ethiopia alongside University of Maryland’s Public Health Without Borders (PHWB) program. The duo joined seven other public health students and faculty to continue partnership work related to food security and nutrition. Stephanie, who served as a faculty advisor for the student-run group, has made the trip four times, three of those with students. The group previously traveled to Debra Berhan, which is a rural community community about 75 miles northeast of the capital city Addis Ababa, in January and June 2015. On those trips, initial work was started in developing a collaborative public health partnership with the goal of improving child nutrition. PHWB meet with faculty, staff and students at Debre Berhan University to develop this relationship. A letter of collaboration is signed with the VP for Research and Community Outreach at Debre Berhan University. 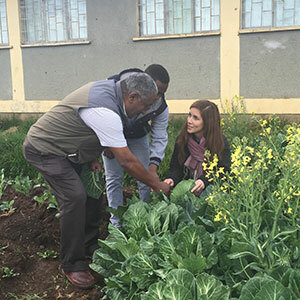 “I’m excited to help community members improve their capacity to address food security and nutrition locally while also strengthening the research and outreach connections between the community and their local university,” Stephanie said. Presenting “Mylnjera” to 60 students in two local primary schools, which categorized popular food dishes based on nutritional content and benefits. Based on data from previous trips on children’s food preferences, the presentation was an adapted version of the U.S. “My Plate” program. Presenting seminars to the Debre Berhan University community, which provided an overview of the intersection of public health and urban agriculture in limited resource communities and an overview of contemporary food borne illness and risk management. Signing a letter of collaboration with the VP for Research and Community Outreach at Debre Berhan University. Visiting prospective school garden sites and meeting with school administrators about the program. Conducting interviews with school teachers at schools that are or will be participating in the project. Public Health Without Border’s program continues its partnership work related to food security and nutrition. PHWB’s work in Ethiopia is based on ties established by Stephanie and retired University of Maryland Extension horticulturist Hiwot Menbere. The group is currently in the planning and grant writing phases to continue its work in Ethopia. Stephanie is planning another trip in May and hopes to bring more OSU students there in the near future. The group’s partnership in Debre Berhan is a work in progress and a testament to the growing need and commitment for collaboration in advancing the health and well-being of people around the globe. Four faculty from Debre Berhan University are planning a visit to OSU in April and will tour the campus and meet with faculty and staff to gain ideas for professional development. Click here for more information about the group’s trip.